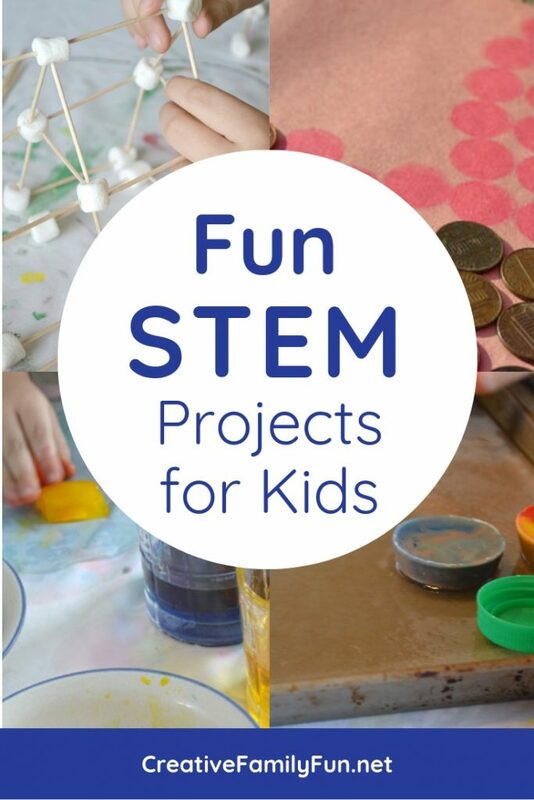 I’m always excited when I find fun STEM projects for kids. Are you? These activities are always so much fun! We get to build, create, and just learn so much. 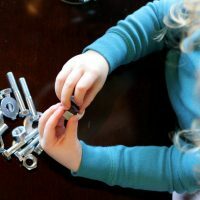 My kids enjoy STEM activities and so do I. So, keep reading for some fun activities you can do with your kids. There are plenty of fun science and math activities, but what sets an activity apart as STEM? First, STEM stand for science, technology, engineering, and math. STEAM adds art to the mix. Most STEAM projects have a mix of at least two of these subjects and many combine them all together. STEAM projects are fun, promote problem-solving and creativity, and are all hands-on. 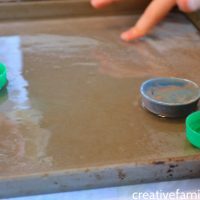 Here are my favorite STEAM activities for kids that we’ve done at Creative Family Fun. 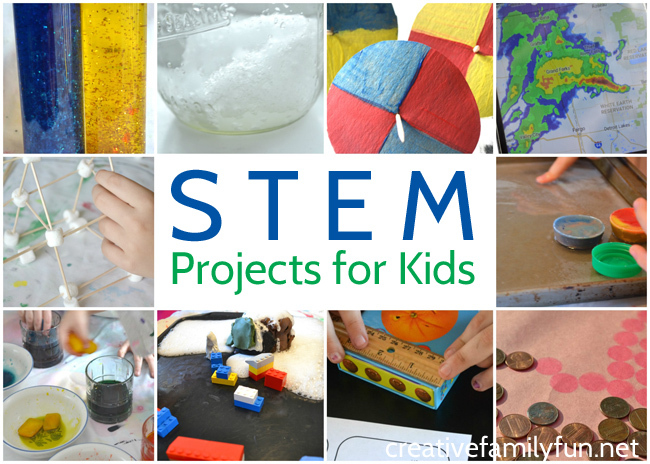 All the fun and family-friendly STEM projects for kids we've done. You'll love them all! 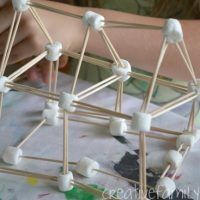 Build structures with marshmallows and toothpicks with this fun and simple STEM challenge. 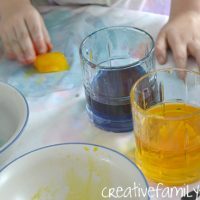 Use the sun to melt your crayons and form them into a different shape with this fun experiment. 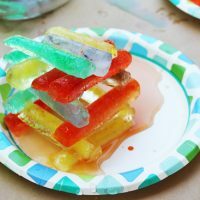 Combine a fun history lesson with a classic science experiment, then throw in a building challenge, and you get this awesome history STEM challenge. 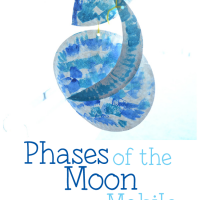 Learn about the phases of the moon with a fun craft project. 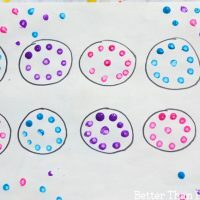 Experiment with color mixing in this simple STEAM invitation. 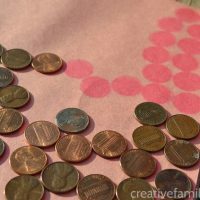 Practice skip counting with this simple art project. 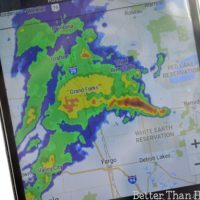 It's amazing how much you can learn with your weather app. Here are some great ways to teach your kids about your local weather. 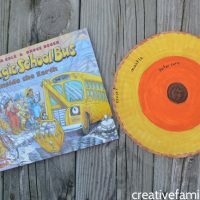 Use the sun to create art with this simple STEM activity. 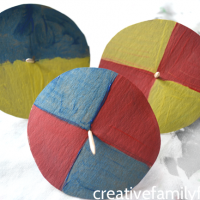 Watch the colors mix when you spin these easy-to-make color mixing tops. Will it sink or will it float? Find our with this classic experiment. 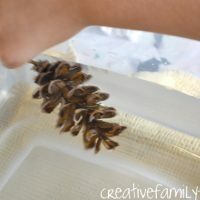 Use water to bend crafts sticks and then turn them into a fun bracelet. Build and create with colored ice. Use recycled materials to make a fun (or several fun) robots. 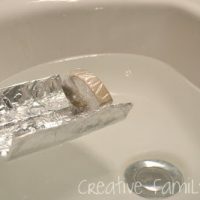 Can you make a boat out of cardboard that will actually float? This is a fun STEM challenge to try. 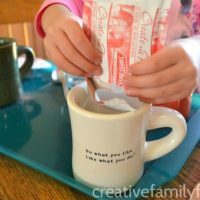 How does temperature affect the rate at which hot chocolate dissolves? 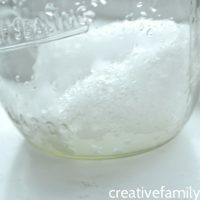 Try this fun experiment to find out! 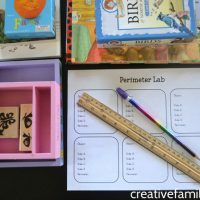 Explore perimeter with this simple math lab invitation. Includes a free printable lab sheet to help you out. What slides the best on ice? 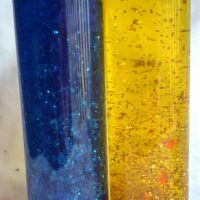 Make some predictions and experiment with this fun science challenge. 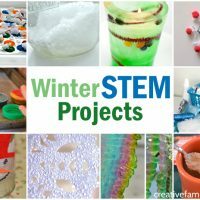 You'll find a ton of fun Winter STEM projects there that will be great to do with your kids. 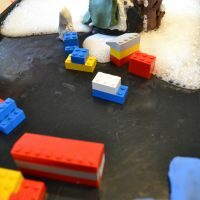 Take advantage of a snowy day to try this simple melting snow experiment. Learn about the layers of the earth with a simple craft project. 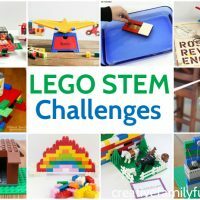 Get out the LEGOs for some fun STEM challenges your kids will love! 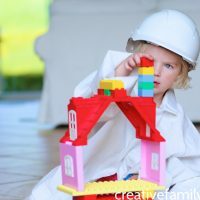 Encourage STEM at home with these fun building toys. You most often see STEM activities used for educational purposes. Of course! Because STEM teaches kids so much. But, it doesn’t have to be for the classroom only. 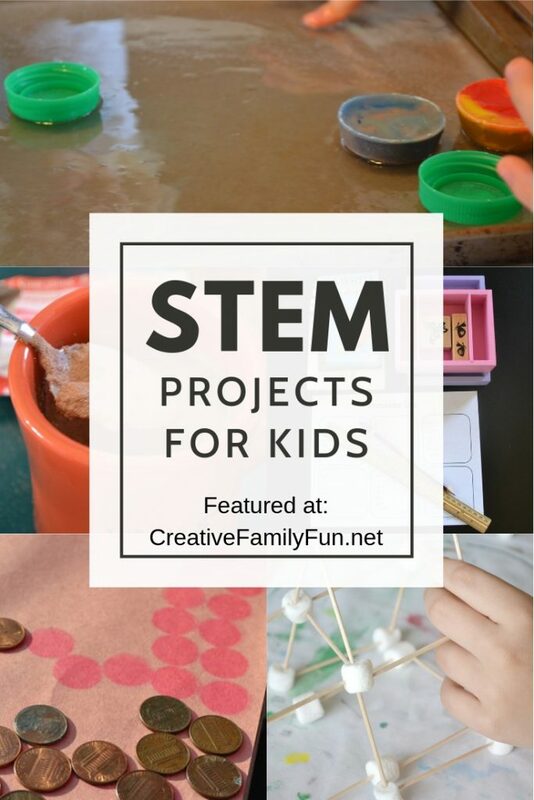 STEM projects also make fun activities for families. I’ve always enjoyed my time with my girls when we do STEM activities. Well, luckily, I’ve got a solution for you. You can subscribe to the STEAM Family Fun email list. I will help you reframe STEM activities into family activities. Plus, you’ll get great ideas for family fun coming regularly to your inbox. 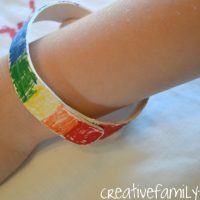 These activities are fun, simple, and perfect for busy families. Are you ready to get started? Just subscribe below! I don’t always have time to put together a fun project. 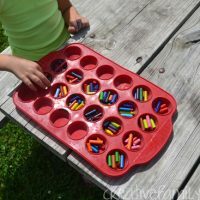 That’s why I love Green Kid Crafts boxes because they provide easy, ready-to-do STEM activities we can try at home. You’ll receive easy-to-follow instructions plus the supplies that you need for up to 6 activities. We have a monthly subscription, but you can also buy single themed boxes (which make great birthday gifts!). If you enjoyed our STEAM projects, you may enjoy the Intro to Electricity box or subscribe to the monthly Discovery Box subscription. Click here for the Intro to Electricity box. Click here for the monthly Discovery Box subscription. Do you love Dr. Seuss books? We do! That’s why we’re going to use our favorites for some fun Dr. Seuss math games. 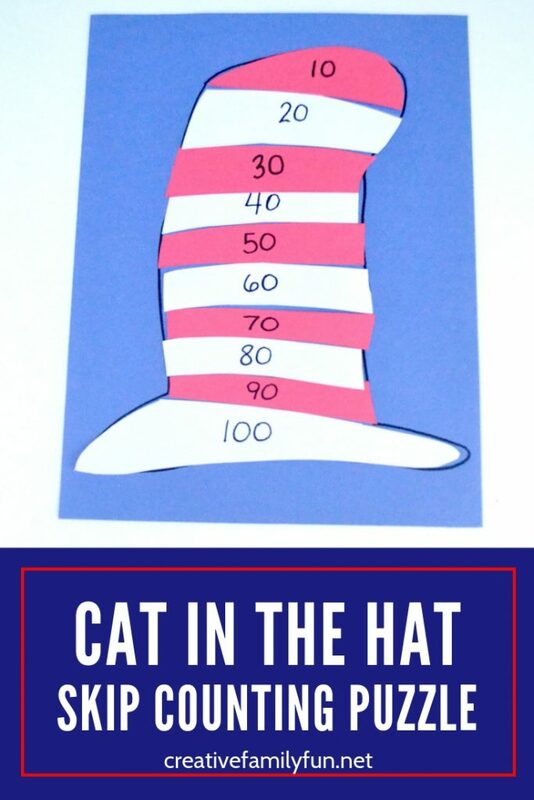 This fun Cat in the Hat Skip Counting Puzzle is a great way to practice counting. We made this puzzle to practice skip counting by tens, but you can do anything that your child needs to work on. Try skip counting by fives or two. Or maybe your child is still counting by ones. This versatile puzzle can work for any counting. 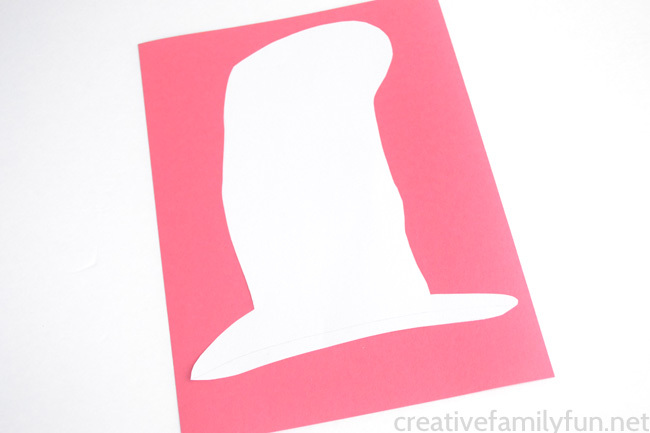 Start by sketching a tall – and slightly crooked – hat on your white piece of paper. Take your inspiration from the pages of The Cat in the Hat. It doesn’t have to be a perfect replica! 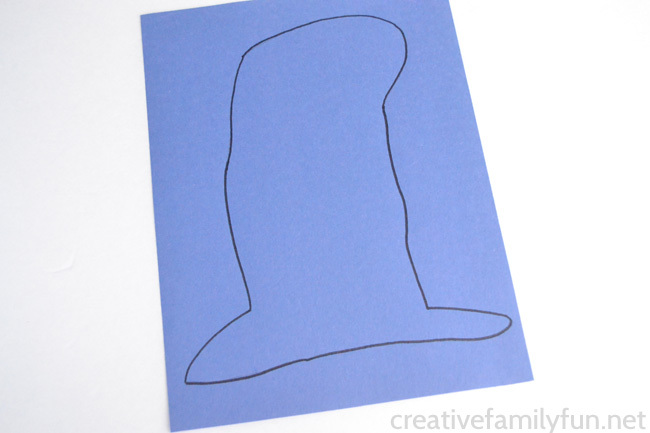 Cut out your hat and trace it on both the red and the blue pieces of paper. Cut out the red hat. Your blue piece of paper is your puzzle board, so don’t cut out that hat. Instead, trace your pencil lines with the black marker. Add your stripes to your white and red hats. You will need 10 stripes on each hat. 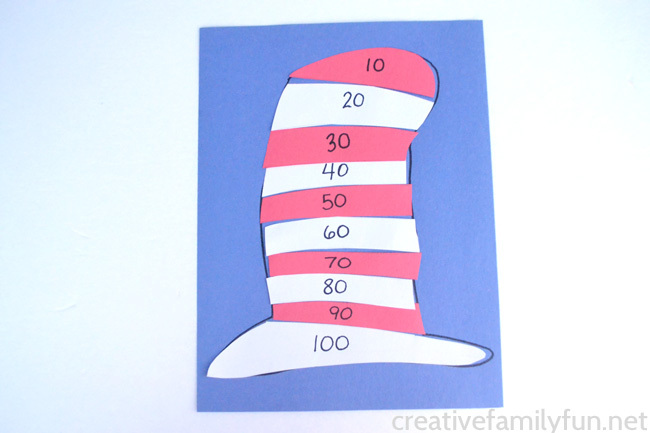 Use a ruler and compare the hats to make the stripes as similar as possible so you can alternate the colors. Cut apart each of your stripes. Next, use your blue puzzle board to alternate the stripes on the hat. Starting at the top strip, write your numbers (skip counting by 10) in order from 10 through 100. If you are worried about durability, run your puzzle board and puzzle pieces through a laminator. Note: If you are making this game for a classroom, you will have enough stripes for 2 puzzles. You’ll just need a 2nd sheet of blue paper to make another puzzle board. Playing the game is super-easy. Just mix up the strips and have your child complete their puzzle by putting the stripes in order. That’s it! 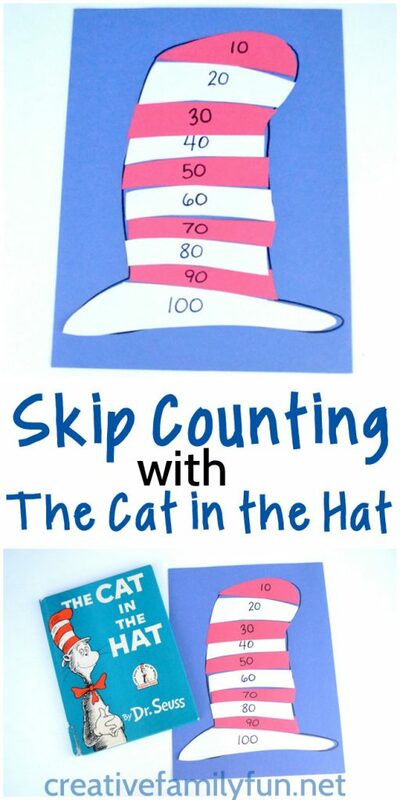 This Cat in the Hat Skip Counting Puzzle is a fun and simple way to practice counting by tens – or any other set of skip counting! 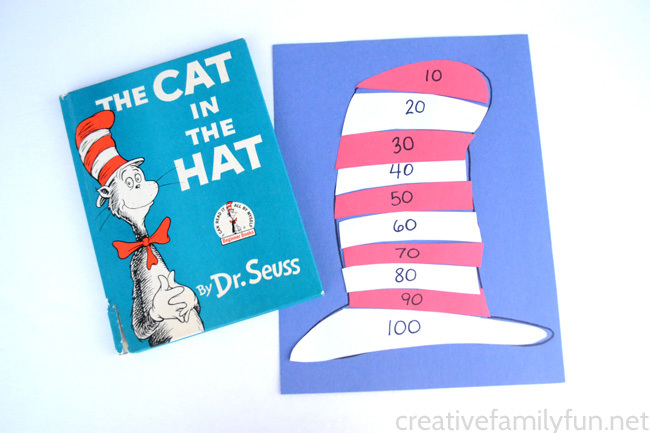 This Cat in the Hat math game is a perfect time to combine an activity with a book. So, grab a copy of The Cat in the Hat or another book featuring this fun character! 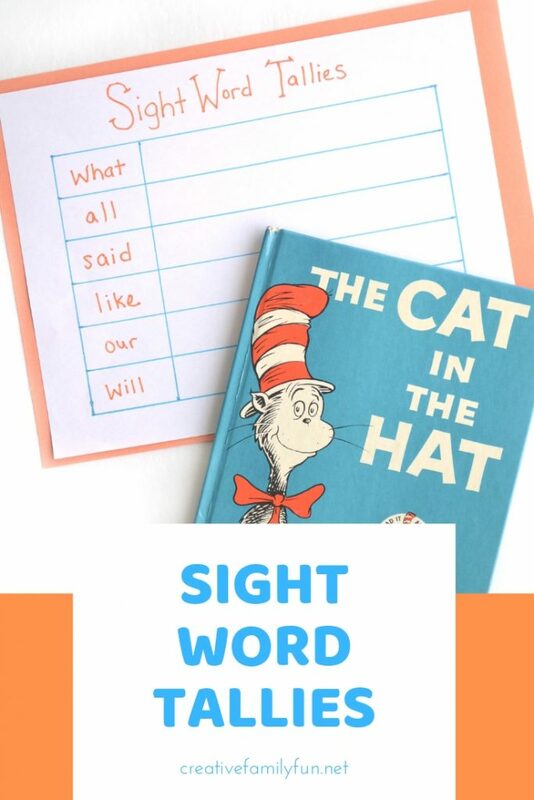 Since my youngest daughter is heading into first grade in the fall, we’ve been focusing a lot on ways to learn sight words. She’s got a great handle on some, but as you know, there are many to learn. We’re trying to keep up the practice over the summer, but I definitely want to keep things simple. 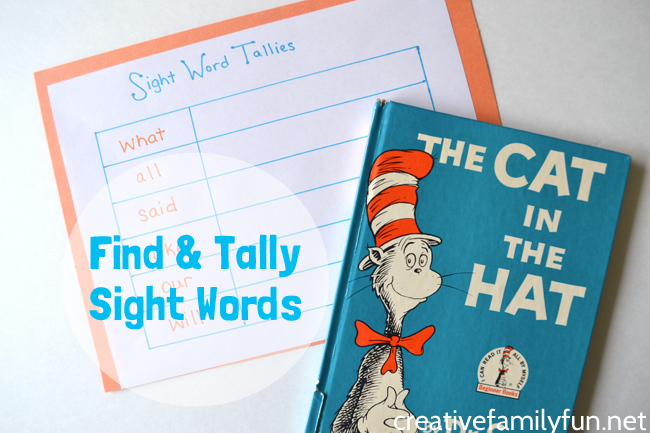 That’s where this fun Find and Tally Sight Words activity comes in. It’s easy to prep. Simple to do. And, it’s fun. This activity was so easy to set up. I started by making a list of sight words that my daughter needs to learn. I chose only six because I didn’t want her to be overwhelmed by too many. Next, I made it into a pretty chart to make the activity all the more appealing. But, this is not at all necessary, you can just grab some paper and jot down a few sight words leaving room for your sight words. Now it’s time to tally sight words! Now, it’s time for the fun. Let’s practice our sight words! Give your child the chart and a book. They need to go through the book and make a tally mark each time they find one of the words. It can be slow going and they may not get through the whole book. We didn’t. Our focus was on sight word identification and not reading, so we just did a few pages. We’ll read the book together later. At the end, add up the tally marks. Which word did you find the most often? The least? Can I give you a quick word of advice? I made the mistake of not comparing my list of sight words to the book when I did this with my oldest. Oops. It was a lesson in frustration. Page after page and no sight word in sight. Take the time to make sure the sight words are actually in the book you’re using. The activity is so much more fun when you can actually find the words! 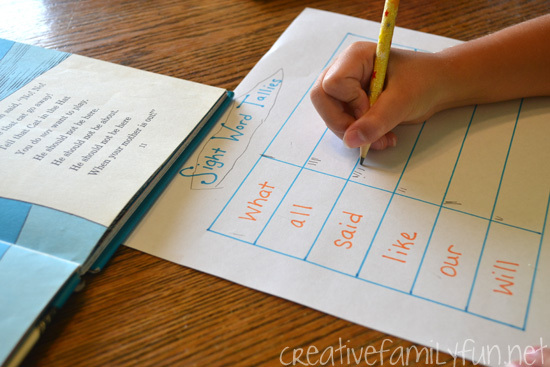 I loved this sight word activity because it was easy to prep and fun to do. Plus, it added in a bit of sneaky math practice with the tally marks. 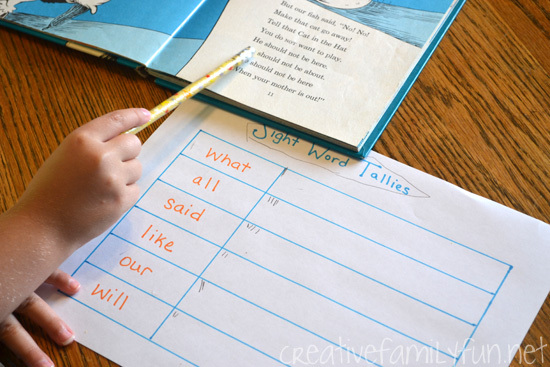 We’ll do this fun Find and Tally Sight Words activity over and over again for a fun way to practice our sight words. Sight Word Islands – get outside and practice your sight words on the driveway. 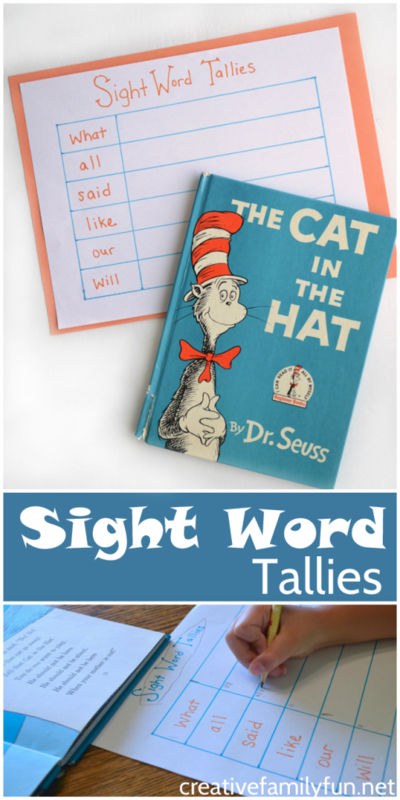 3 Easy Ways to Practice Sight Words – the easiest ideas ever! Practice writing your sight words in a Dragon Sensory Writing Tray from Inspiration Laboratories. We found success using a book that my child was already familiar with. I’d suggest you turn to your own library of books for inspiration. You’ll want a book with several instances of the sight words you’re working on. Do check to make sure the sight words you need are in the book! I’m a writer, so punctuation comes naturally. It seems like it’s something I’ve always known. But, I know that’s not the case. Once upon a time way back in elementary school, I learned the basics – how to end a sentence. Do you use a period, a question mark, or an exclamation point? The choice is important. 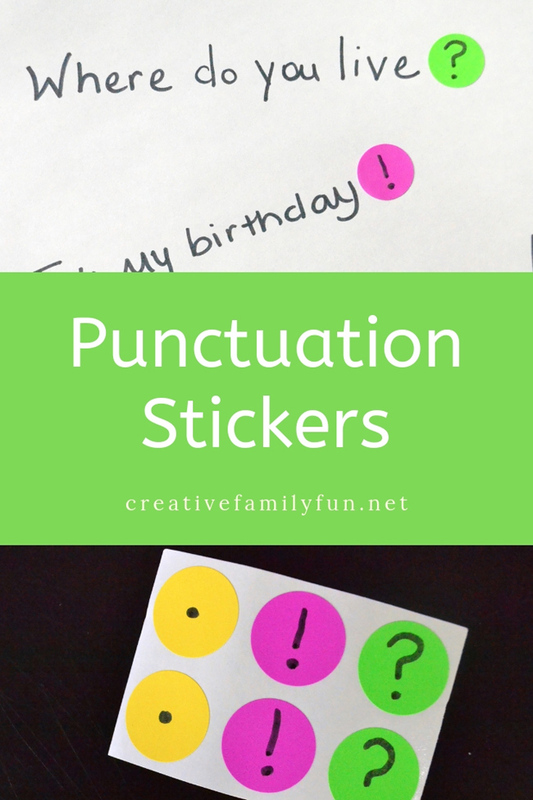 If you’ve got a child working on these basic grammar rules, I’ve got an easy DIY punctuation activity you can make in minutes, Punctuation Stickers. You only need a few simple office supplies and about five minutes to prep this game. Trust me, it’s easy! Start by coming up with a few sentences. I only planned on six sentences, two for each type of punctuation. Make the sentences simple and obvious. 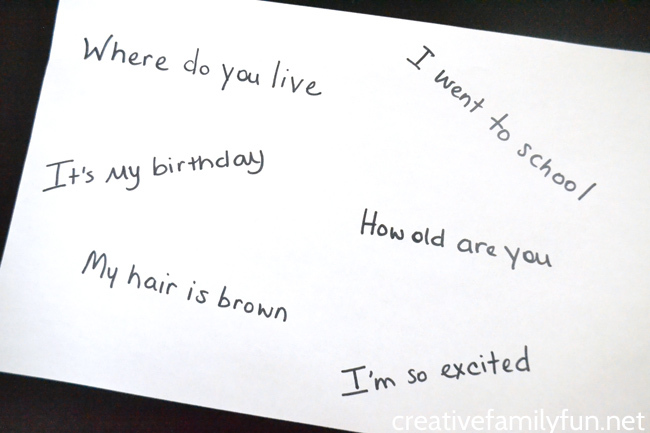 For example, start your questions with a question word like who, what, when, where, or how. Write down each of the sentences on your white paper. Leave enough room to add a sticker at the end. 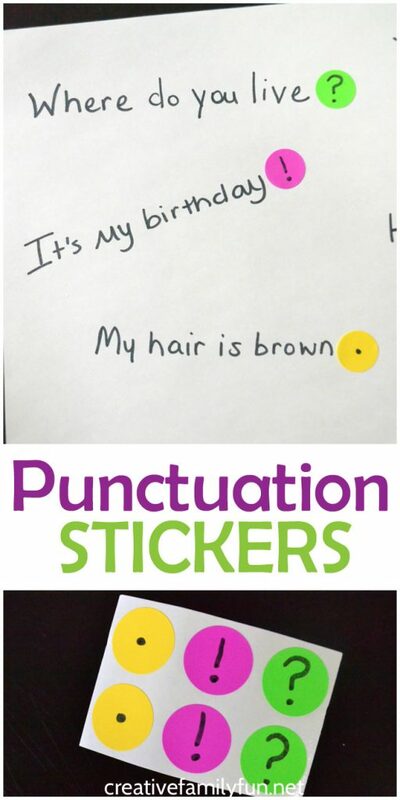 Next make your punctuation stickers. This step couldn’t be easier. 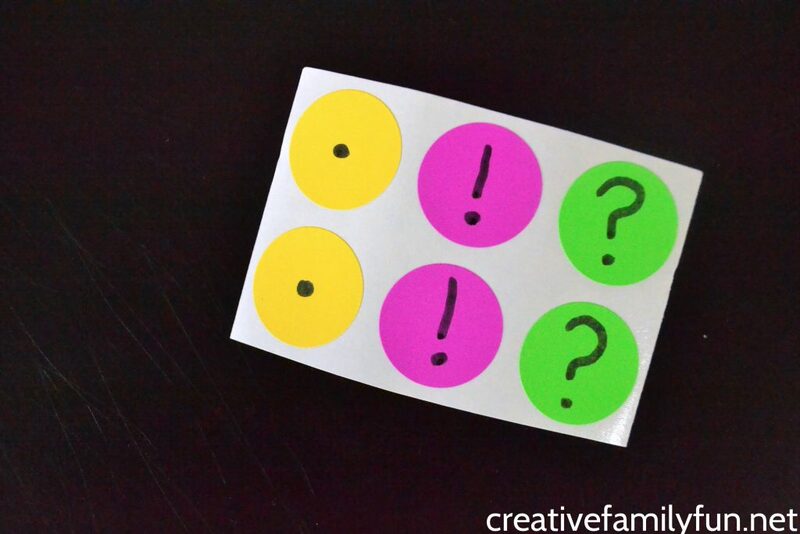 Add the punctuation marks you need on the dot stickers. I had two periods, two question marks, and two exclamation points. Your game is done. See how easy this is? Game play is simple. Just choose the correct punctuation sticker and place one at the end of each sentence. This missing punctuation game is most beneficial for kids who are just beginning to learn about punctuation and need some additional practice. It’s also an easy at-home check-in so you can see if your child has mastered this skill. If you child is beyond the basics but still needs practice, extend the difficulty of the sentences. Or, you could even offer them a paragraph. Just make sure to leave enough room for your stickers. Make it bigger! Tape a piece of brown wrapping paper to your wall and cover it with sentences. This is also a fun way to learn when your child is tired of sitting. If you don’t want to (or don’t have time to) write your own sentences, just download and print the sentence strips from this Cut & Graph Punctuation Game. 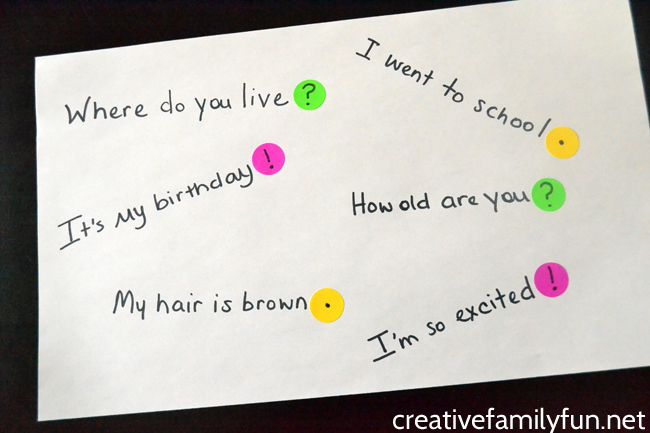 Use your punctuation stickers to put at the end of each of the sentence strips. With a little practice, it won’t be long until your kids are completely comfortable choosing punctuation to end a sentence. 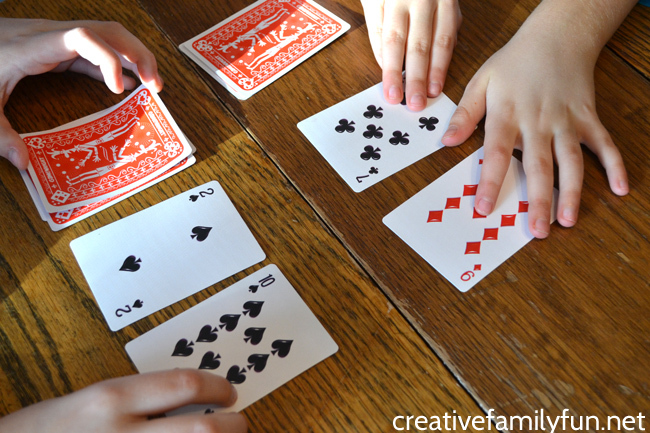 One of my favorite tools for practicing math with my kids is a simple deck of playing cards. There are so many fun things you can do! You can count, compare numbers, subtract, or even multiply. 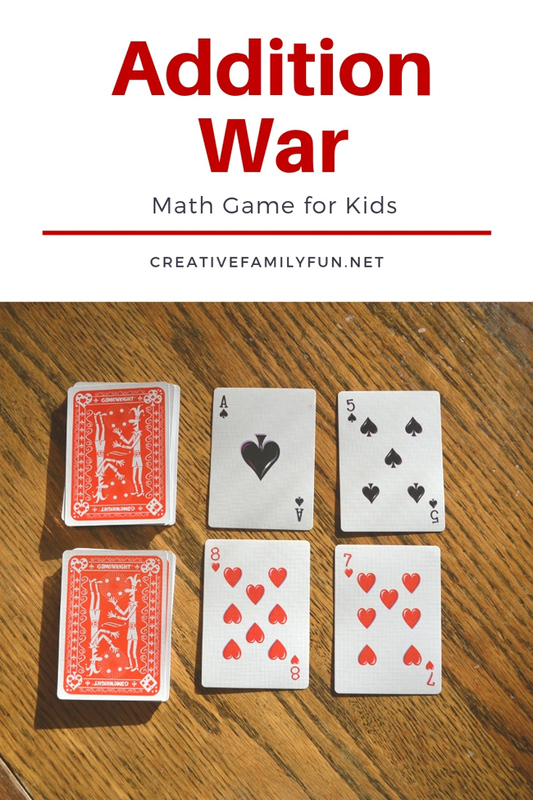 Today, we’re going to practice our addition skills with a few fun games of Addition War. 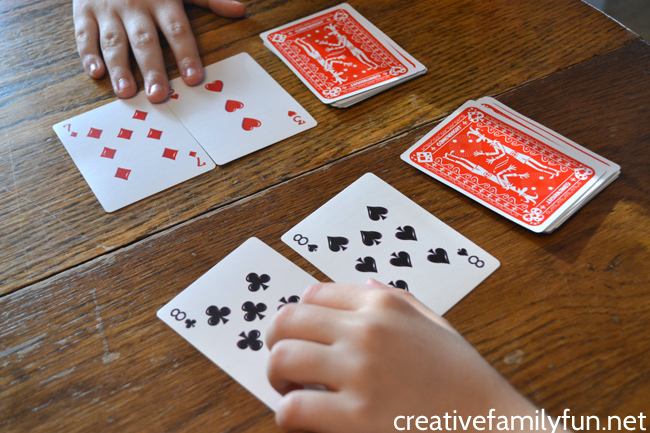 There are so many other fun ways to practice math with playing cards, For example, you can start with the basics, like this greater than or less than activity. Or, you can practice harder math like this 3-digit addition activity. 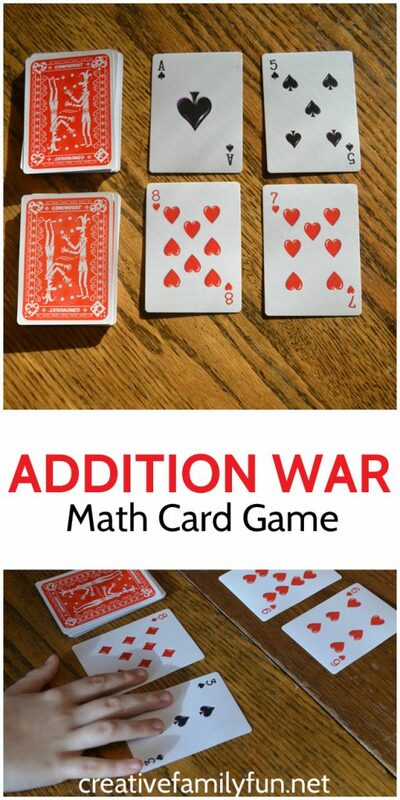 You will need two people to play Addition War, no more and no less, and a deck of playing cards. Play with a friend or play with a parent. 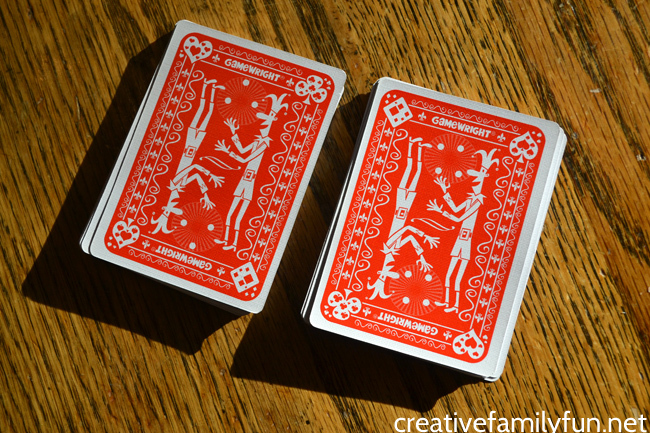 Before beginning, you will want to pull all the jokers, jacks, queens, and kings from the deck. Shuffle the cards and deal the entire deck to both players. Each player should have an equal amount of cards. This game is similar to the classic card game War, but with a few twists. I’ve simplified the rules and incorporated addition into the game. To start each player will turn over the top two cards in their stack and lay them side by side. Then, each player will add their two cards together. The player with the largest sum gets all four cards. Put them in a discard pile. Each player will have their own discard pile. Keep playing until the two piles of cards are gone. After all the cards have been played, each player will count the cards in their discard pile. The player with the most cards wins. What if the sums of both players cards are equal? If the players’ cards are equal, leave them on the table and turn over the next two cards in the stacks and lay them on top of the first pair of cards. The player who has the highest sum of their top two cards will take all eight of the cards. You can make the game a little harder by leaving the kings, queens, and jacks in the deck. When adding your cards together, each jack would equal 11, queens are 12, and kings are 13. If you’re working on adding more than 2 numbers together, each player can turn over 3, 4, or even 5 cards at a time. The game will go quicker, but it will still be fun. 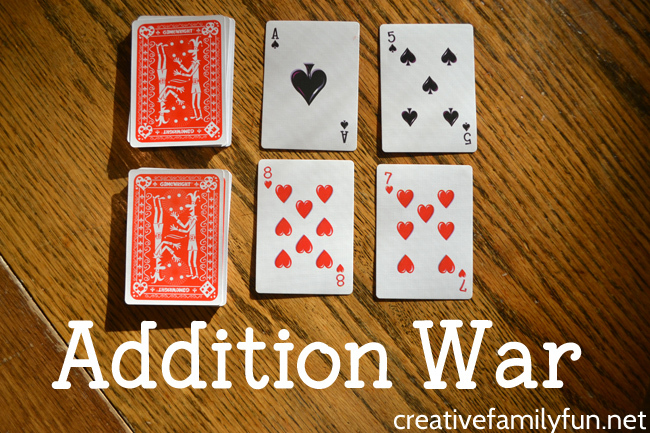 Finally, you can also play this game using multiplication. Instead of adding the two cards together, multiply them!